A collection of our 8 best selling Paleo spice blend rubs, including those from our new 'Summer Collection'. 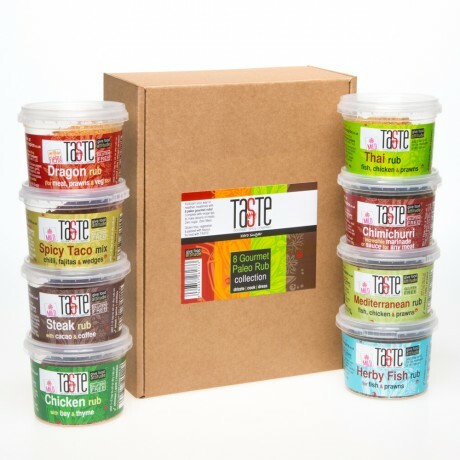 Set contains: Chimichurri, Thai rub, Mediterranean rub, Herby Fish rub, Dragon rub, Steak rub, Spicy Taco & our top selling Chicken rub. Our spice rubs are roasted and ground in small batches, so you’re likely to have a blend that’s only been ground a few days or a couple of weeks at most. These spice blends can be used as either dry rubs or wet marinades to transform simple meat, fish or vegetable dishes. Herby Fish rub (mild): Our gorgeous Herby Fish Rub is herby, citrusy & fresh - perfect for those summer fish dishes! Lots of fragrant herbs & some lemony sumac keep this rub light & perfect for adding a huge boost to fish without overtaking it. Great on chicken & pork too. Chimichurri Rub (mild):Our Chimichurri is an awesome way to enjoy red meats! It's herby, garlicky & delicately spicy with warmth with its blend of smoked paprika & bell peppers. This gorgeous blend will utterly transform anything it touches. The classic way to use it is as a sauce or drizzle over cooked meats; mix with a splash of oil & red wine vinegar to form a loose sauce & leave for a few hours for the herbs to rehydrate & for all the flavours to meld together. Then drizzle a spoonful over sliced steak, game or other red meats. Mediterranean Rub (fiery): Our Mediterranean Rub is our take on Greek or Italian Seasoning rolled in to one delicious pot of flavour! It's herby & fresh with a richness that will give anything a kick of pure taste! It's great for fish, pork, chicken, seafood or veg - try throwing a pinch onto a pizza just before you serve it too! 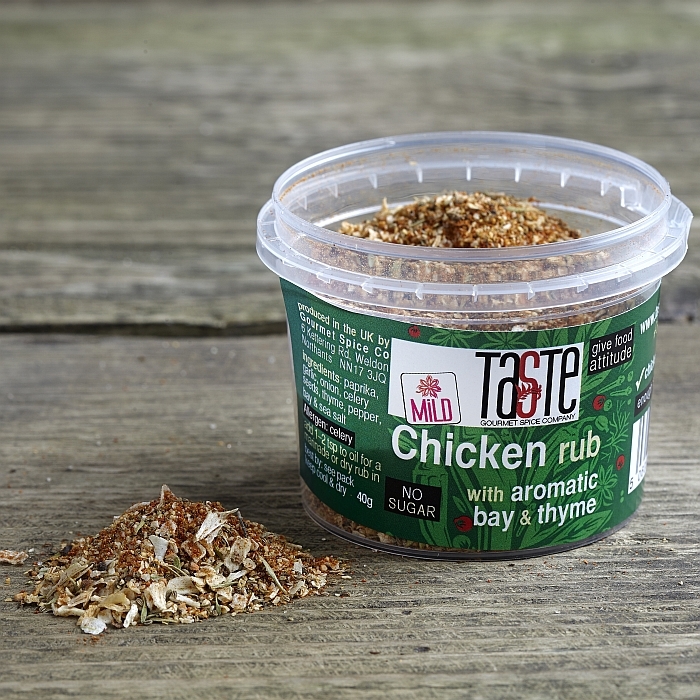 Dragon Rub (fiery): Our fiery Dragon Rub is zingy & fresh with an incredible kick of flavour & spice. It's a great alternative to a Jamaican Jerk & it's perfect for fish, pork, chicken, seafood or veg! 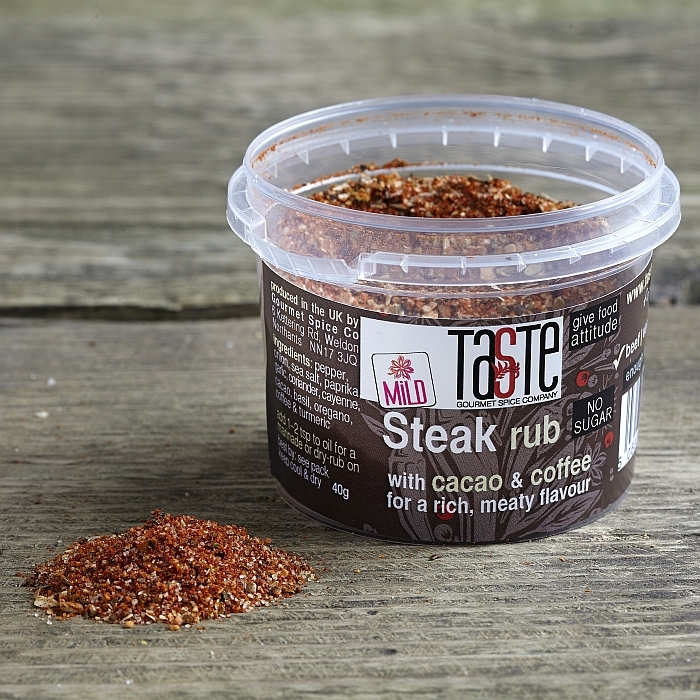 Steak Rub (fiery): Our Steak Rub is an incredible seasoning for steak and other red meat: it adds levels of flavour with its complex range of spices, yet doesn't overpower the flavour of the meat. Spicy Taco (mild): great for fajitas, tacos, chillies, mince, wedges & chicken. Thyis is our 'go-to' seasoning and the one we use the most of! 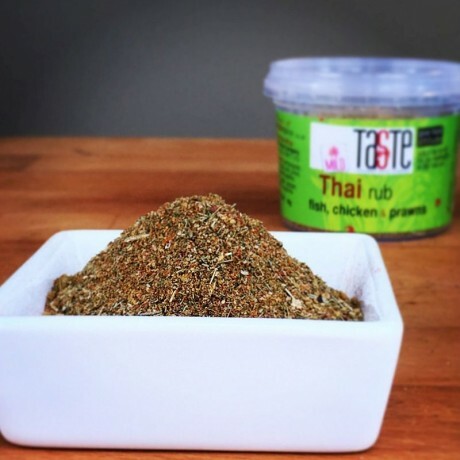 Chicken Rub (mild): Tired of cooking chicken the same way? Our Chicken Rub has lots of thyme & bay to give white meat & lot veg a terrific boost. For a really easy salad, add a pinch of Chicken Rub to a chicken breast & flatten it between cling film to get it al the same thickness (and increase the surface area for more flavour!). It should only take about 5 mins to cook this way. Slice it into strips, scatter it over a salad with some croutons and dress at the last moment! This product is dispatched by Gourmet Spice Company. This item has a shipping weight of 360g.